Earthfill dams are less rigid and more susceptible to failure. 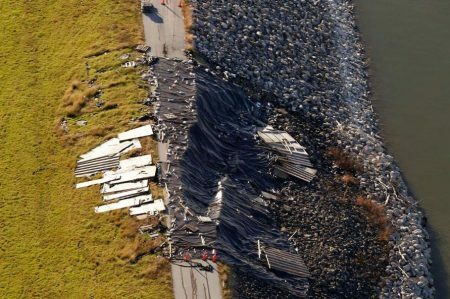 Like most of engineering structures, earth dams may fail due to various reasons such as faulty design, improper construction and poor maintenance practices, etc. Different causes of failure of earthfill dams are explained below. 4 out every 10 earthen dams have failed due to hydraulic failures. The Hydraulic failure of an earthen dam arise due to any of the following causes. The upstream face of dam may subjected water waves which are formed due to winds and these waves notch-out the soil from upstream face which causes erosion. Sometimes this may also cause slip of upstream slope. To overcome this, stone pitching or rip rap should be provided on upstream face of dam. The tail water present on the downstream side or cross-currents may come from spillway buckets may affects the downstream toe portion and erosion occurs. To prevent this problem, stone pitching or rip rap should be provided on the downstream face of dam up to a depth of normal tail water level. To prevent cross currents from spillway, sidewalls of spillway should be constructed with adequate height and length. Hydraulic failure also occurs when the water over-tops the dam crest. This may be due to insufficient capacity of spillway or design without proper estimation of flood level or problem in lifting of spillway gates during flood times. To prevent over-topping of dam, adequate freeboard should be provided. In low temperature zones, the upper portion of dam may subjected to frost and heaves and cracks may form in the soil. These cracks will cause seepage through them cause failure. So, in such zones, additional freeboard should be provided which is generally 1.5 m excess to the normally provided freeboard. 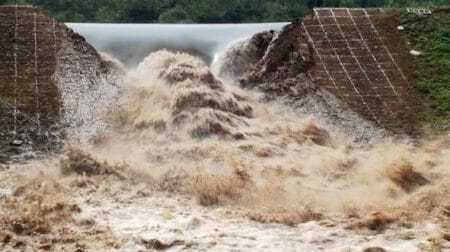 When the downstream face of dam is subjected to heavy rains, the rainwater or runoff will flow with high downward velocities which causes erosion of soil on the downstream face and this may also lea to formation of gullies. 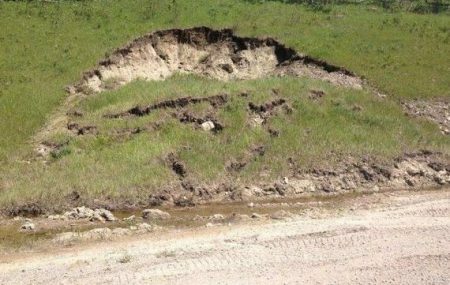 This can be prevented by providing berms on the downstream face at suitable heights. Drainage facilities should be provided at these berms so, runoff will be collected here before reaching high downward velocity resulting elimination of erosion. By grassing the downstream face also erosion due to runoff can be prevented. It is also important to inspect and fill the gullies or cuts with new soil from time to time during rainy seasons. Seepage through earthen dam is casual but it is considered as harmless when it is limited or controllable. If it is uncontrollable or concentrated seepage then there occurs problems such as piping and sloughing. 1 out of every 3 failed dam cases have seepage failures. When the foundation of earthen dam consists gravel or coarse sand layers or fissures etc., the water from upstream will seep through it. The seepage at higher gradient erode the soil and creates hollow spaces inside the foundation which is called as piping through foundation. This problem will cause the dam to sink downwards resulting failure of dam. Hard and impermeable strata should be selected as foundation for dam to avoid piping through foundation. Piping through dam body will occur due to seepage of water through dam body. This is mainly due to insufficient compaction of soil used for the dam, faulty construction of dam, shrinkage cracks, animal burrows in dam body, etc. This problem will arise mostly near the pipe conduits passing through dam body. 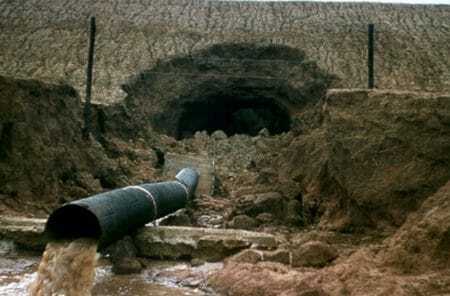 Piping may develop due to seepage along the outer side of conduit or due to leakage of conduit inside the dam body. To prevent this, the soil layers around the conduits must be fully compacted as well as the conduits should not be overloaded. IF the downstream toe of dam gets saturated by piping or any seepage action, it will get eroded and forms small slide or small slump. The slump will create steeper face which again gets eroded due to seepage and form slump again. This progressive removal of saturated soil is called sloughing. This will finally lead to removal of soil from whole downstream face and makes the dam body thin resulting failure of dam. 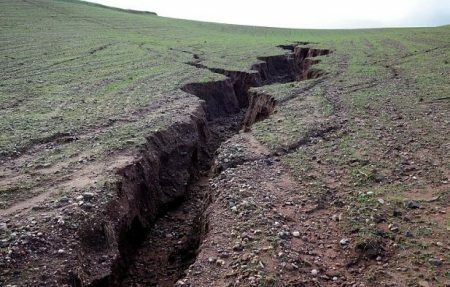 Another cause for failure of earthen dams is structural failures. About 1/4th of earthen dams have failed due to structural failures. Sliding of foundation is nothing of sliding of whole dam body. This occurs when the foundation contain soft clay, fine silt etc. 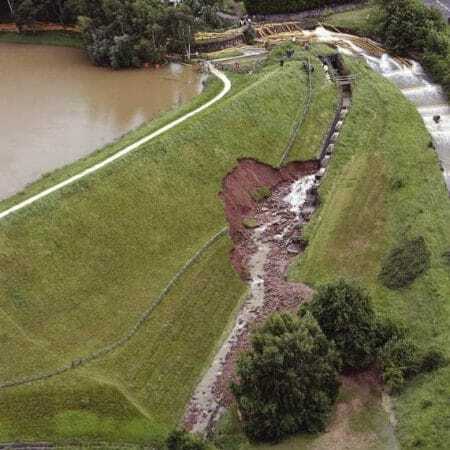 This type of foundation material will cause sliding of entire dam which will cause cracks on the top of embankment and forms mud waves near the upstream heel. Sliding of embankment occurs when the slope of embankment is too steep. 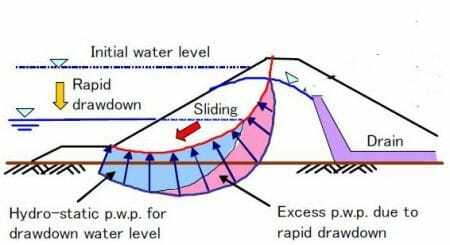 When the reservoir water level is suddenly draw down, then there is a chance of sliding of upstream slope. Similarly when the reservoir is at full level, then there is a chance of downstream slope failure. The above failures are mainly due to excessive pore water pressure which reduces the soil shear strength. Among the both cases, downstream slope slide is very dangerous. Most of embankments are failed during consolidation process.